The death of Julius Caesar led to thirteen years of war and ultimately led to the end of the Roman Republic. By 33BCE, both Caesar’s most trusted lieutenant and the last queen of Egypt would be dead, and a young man Caesar apparently met only once would become Caesar’s adopted son and the most powerful man in Rome for over forty years. The story begins in Egypt. By the time of Caesar’s death, the Greek-speaking Ptolemy family had ruled Egypt for more than 275 years. Ptolemy was a general who took control of the ancient land upon the death of Alexander the Great. 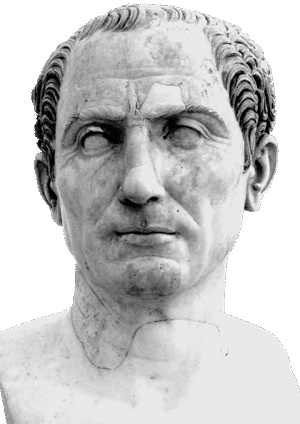 Julius Caesar arrived in Egypt in pursuit of a rival general named Pompey. Caesar chased Pompey first to Spain, then to Greece and finally in 47BCE to Egypt. In Egypt, the ten-year-old Ptolemy XIII presented Caesar with the decapitated head of Pompey. While in Egypt, Caesar found himself in the middle of a family feud. King Ptolemy XII had willed his throne both to his ten-year-old son, Ptolemy XIII, and his eighteen-year-old daughter, Cleopatra. The pair were to rule Egypt together both as brother and sister and as husband and wife, but Ptolemy XIII seized power and forced his older sister from the throne. When Cleopatra learned Caesar was in Egypt, she saw an opportunity to return to power. Cleopatra arranged to smuggle herself into Caesar’s suite wrapped in an ornamental carpet. When Caesar unraveled his gift, he found the former queen. Cleopatra convinced Caesar to remove Ptolemy XIII and return her to power. Caesar’s army defeated Ptolemy XIII’s forces in battle; the Roman army was in pursuit of the young Egyptian king when he drowned in the Nile River. Cleopatra returned to power and following the custom of Egypt at that time, she married an even younger brother, Ptolemy XIV. The couple ruled as both husband and wife and as brother and sister. The 54-year-old Caesar began a love affair with the much younger Cleopatra. The pair traveled the Nile together where Caesar witnessed Cleopatra’s luxurious lifestyle. Caesar was the most powerful general in the world, but the Egyptians worshipped Cleopatra as a goddess. Soon after their voyage, Cleopatra gave birth to Caesar’s only son, Caesarion. Shortly after Caesar returned to Rome, Cleopatra and Caesarion came to visit, staying in one of Caesar’s country homes. Caesar was popular with the Roman people, but the presence of a foreign woman in Rome was a scandal. Further, both Caesar and Cleopatra were married to other people. Caesar’s murder in 44BCE plunged Rome back into civil war. Caesar’s most trusted general—Marc Antony–took control of Rome, but Caesar had a surprise for everyone. The dictator’s will named Octavian, his eighteen-year-old grandnephew, as his heir. An heir is someone who inherits a title or possessions. Despite having met only once, Caesar’s will decreed that Octavian be treated as his son. Octavian instantly became one of the wealthiest men in Rome, but even more important, Roman law allowed Octavian to call himself Caesar. Octavian came to Rome to claim his inheritance, but Marc Antony dismissed the young heir. Octavian raised an army of soldiers who were loyal to Julius Caesar, plunging Rome into months of turmoil. 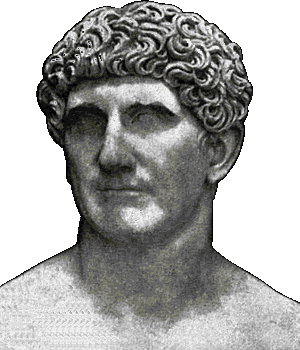 As a result, Octavian and Marc Antony agreed to an uneasy truce; Marc Antony married Octavian’s sister to seal the alliance. Octavian and Marc Antony formed the Second Triumvirate with a third general named Lepidus. Octavian remained in Rome while Antony took control of the empire’s eastern provinces. 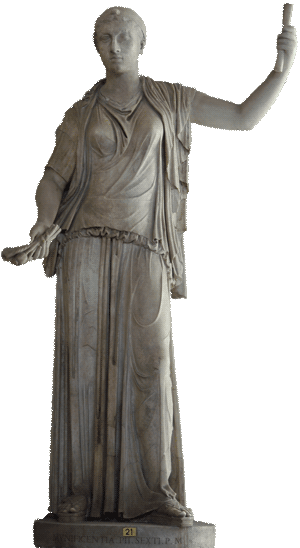 In 41BCE, Antony summoned Cleopatra to answer questions about her loyalty. The Egyptian queen so charmed Antony that he moved to Alexandria to be with her. Cleopatra regained sole control of Egypt after the mysterious poisoning of Ptolemy XIV. Antony and Cleopatra fell in love and had three children together. Antony hoped to oust Octavian and rule both Rome and Egypt with Cleopatra, but Octavian used their relationship to his advantage. Octavian told the Roman people that Cleopatra cast a spell on Antony and argued that Antony was willing to give away the Roman world to a foreign woman. Octavian declared war on Cleopatra, forcing Marc Antony to choose between Cleopatra and Rome. Antony chose Cleopatra. 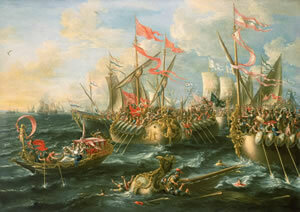 Octavian’s forces defeated Antony and Cleopatra’s ships in the Battle of Actium on the Mediterranean Sea in 31BCE. Antony and Cleopatra managed to escape the encounter, but Marc Antony committed suicide as Octavian’s army approached. When Cleopatra learned of Antony’s death, she realized that Octavian’s army would kill her. The Egyptian queen chose to end her life on her own terms. 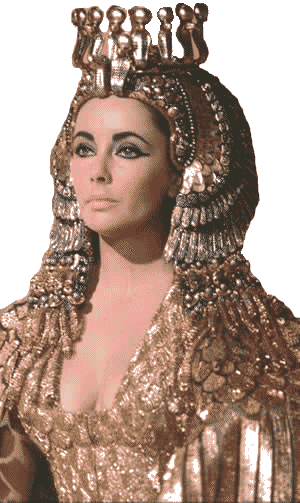 According to legend, Cleopatra wrapped an asp around her arm. The asp is a venomous snake that was the symbol for Egyptian royalty. The asp’s bite ended Cleopatra’s life and the rule of the Ptolemys. Julius Caesar arrived in Egypt in 47BCE in pursuit of a rival general. While in Egypt, the 54-year-old Caesar met and fell in love with the eighteen-year-old Cleopatra. After Julius Caesar’s death, Cleopatra’s relationship with Marc Antony caused a scandal in Rome. Statue of Cleopatra on display in Vatican City.